The Series 3PBV 3-Way Plastic Automated Ball Valves are ideal for mixing or diverting services in industrial, chemical, turf and irrigation, and pool and spa applications, as well as for use with potable water. The valve features a 3-seat design for efficient automation, reinforced TFE seats and EPDM seals for longer life, and an all PVC construction for heavy weight durability at a lightweight cost. Valves also come standard with field selectable NPT or socket process connections. 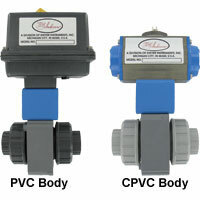 The 3PBV is an economical automated valve package with either an electric or pneumatic actuator. Electrically actuated models are weatherproof, NEMA 4, powered by standard 115 VAC supply, and are available in either two-position or proportional control. 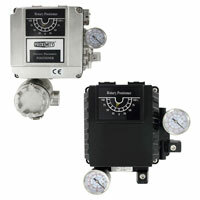 Two-position actuators use the 115 VAC input to drive each of the valve ports open or closed, while the modulating actuator accepts a 4 to 20 mA input for infinite valve positioning. Actuator features include thermal overload protection to withstand stall conditions, visual position indication and a permanently lubricated gear train. The pneumatic double acting actuator uses an air supply to drive each of the actuator ports. Spring return pneumatic actuators use the air supply to drive the valve stem one direction, and internally loaded springs return the valve to its original position. 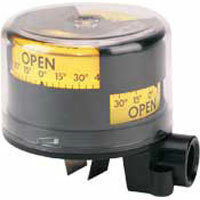 Also available is the SV3 solenoid valve to electrically switch the supply pressure between the air supply ports. 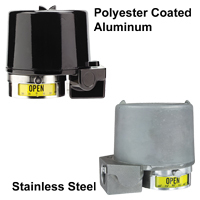 Actuators are constructed of anodized aluminum and are epoxy coated for years of corrosion free service. 1. Select Model Number to specify pipe size and actuator. 2. Choose a Port Configuration to determine valve flow path. Female NPT or socket (field selectable). 1/2" to 1": 232 psi (16.0 bar) @ 73°F (23°C); 1-1/4" to 2": 150 psi (10.3 bar) @ 73°F (23°C) WOG. Vacuum: 29" Hg. See Catalog page for curve. Body & End Connections: PVC; Ball & Stem: PVC; Seat: TFE; Stem Seal: EPDM. 120 VAC, 50/60 Hz, single phase. Optional 220 VAC, 24 VAC, 12 VDC, and 24 VDC. Two Position: 1/2" to 1-1/2": 0.55A; 2": 0.75A. Modulating: 0.75A. Two Position: 1/2" to 1-1/2": 2.5 sec. ; 2": 5 sec. Modulating: 5 sec. Two Position: 1/2" to 1-1/2": 75%; 2": 25%. Modulating: 75%. NEMA 4. Optional NEMA 7 (Class 1, Div. II, Groups A, B, C, D). Aluminum with thermal bonding polyester powder finish. 0 to 150°F (-18 to 65°C). Manual override and visual position indicator except modulating units. DA1 to 2 and SR2 to 3: 1/8" female NPT; all others: 1/4" female NPT. DA1: 2.32 cu. in. ; DA2 & SR2: 9.34 cu. in. ; SR3: 17.21 cu. in. DA1: .03 sec. ; DA2: .04 sec. ; SR2: .09 sec. ; SR3: .14 sec. -4 to 180°F (-20 to 82°C). Explosion-proof Electric Actuator - Add suffix "EX" to the model number. Optional Electric Actuator Supply Voltages - Contact factory for model number change - 24 VAC, 220 VAC, 24 VDC or 12 VDC. 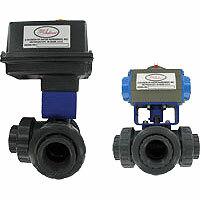 Solenoid Valve -- See Model SV3. Series 3PBVPDA102-L1-SV 1/2" PVC Automated Ball Valve, direct acting rack & pinion actuator, size 32, L-port configuration 1, with 120 VAC solenoid valve.